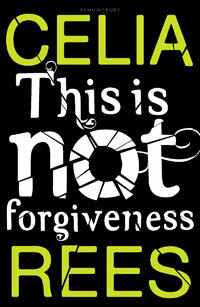 I'm excited to be taking part in the blog tour to celebrate the release of Celia Rees' latest novel This Is Not Forgiveness. The book is like nothing else I've ever read and is a chilling story with themes of war, terrorism and much more. I'll be posting my review later today so make sure you come back and read it. Let me hand you over to Celia Rees who is going to be talking about some of the best fictional deaths . . .
Lucy Westena in Bram Stoker’s Dracula, because she gets to die twice. I’m strictly old school when it comes to vampires. They have to be scary and they have to mean it, no veggie ‘will try to do better’ vamps for me. Once Dracula picks her out as a victim, there is no escaping; she’s destined for the family vault in Highgate Cemetery, living her vampire half life as the ‘booful lady’ preying on young children, until men with sharp stakes come to put her out of her misery. Perfect! They don’t write them like that any more, more is the pity. Thelma and Louise in Ridley Scott’s film Thelma and Louise because they have put themselves outside the law and they don’t have any choice, which makes their deaths heroic and romantic, and maybe, just maybe, they didn’t die at all, but their car just flies, or else it lands gently on the other side of the canyon and they quietly drive away. Anna Karenina in Leon Tolstoy’s Anna Karenina because she dies so needlessly. Throwing herself under a train for a cad and bounder – you feel like giving her a good shaking and telling her to get a grip. Gustave Flaubert’s Madame Bovary because she dies so badly. Given to romantic fantasy and self delusion, trapped in a suffocatingly boring provincial life, she is living inside her head, embarking on affairs, spending money she hasn’t got. When it all goes hideously wrong, she takes arsenic and lies back waiting to die a nice death. That doesn’t happen. She dies in horrible agony. Anyone who thinks there is anything romantic about suicide should read Madame Bovary. ‘"It is a far, far better thing that I do, than I have ever done; it is a far, far better rest that I go to than I have ever known.'" I re-read it when I was writing Sovay, and had to wipe a tear way. Deaths in Fiction don’t get much better than that. Thanks so much for a fabulous guest post Celia, I have only read (or watched) the first two stories that you mentioned but completely agree with what you said about them. You got me thinking about the fictional deaths that have had the biggest impact on me and the first one that comes to mind is in Forbidden by Tabatha Suzuma, I can't go into detail without giving a major spoiler so I'll just say that the ending of that book made me sob like a baby. Another one that really broke my heart was the death of Tessa in Before I Die by Jenny Downham. You know right from the beginning that her leukemia is going to kill her but the ending had a massive impact on me because it brought back memories of my Nan's death. Now how would you like the chance to win a SIGNED copy of This Is Not Forgiveness? Courtesy of Bloomsbury I have a signed paperback of This Is Not Forgiveness to giveaway to 1 lucky UK winner. The giveaway will close at 12:01am EST on the 25th of February 2012 and the winner will be contacted soon afterwards. You will have 48 hours to reply to me with your address or a new winner will be chosen. Don't forget to check out the other stops on the This Is Not Forgiveness Blog Tour for more fabulous posts from Celia Rees. See the banner below or click here for full details of all the stops. I think the one that stands out though is Ender's first kill, when he's just a small child in Ender's Game. Chilling, even though he didn't mean to do it. Dobby's death, he was so brave and it was so moving. I cried like mad. Ethan Sullivan in Chicagoland Vampires...im pretty sure i cried or screamed, may be both?? Also Rue in The Hunger Games..that was so shocking in its cruelty. Yep i defo cried at that one. From someone who reads a lot of crime and thriller books I can't actually say i have a memorable one. @ liveotherwise - I've never read Ender's Game but have heard really good things about it so I must give it a try one day! @ barmybex - ahh that one really upset me too! Georgia Mason in Feed by Mira Grant. I couldn't believe she died, it was such a shock! Fictional deaths when it involves a character you like is always a shock to the system. Dobby is a top death of mine, too. Thanks for the giveaway! Only 5 GFC followers off 1000!! It has to to be Martin from Lenobia's Vow. @ rosiepopsox - I'd forgotten about that one but you're right it was very sad, there were a lot of other sad deaths in that series too! @ Sam - oops sorry you picked up a spoiler there - I didn't really think it through properly when I asked this question did I! Aww poor Dobby, I get sad everytime I think about what happened to him! @ AlexSarahLouise - I've not read Lenobia's Vow, I'm so behind on the House of Night books it's crazy. I will catch up with them one day! one of my favourites is actually from a kids book, it is because it is SO gory. In Raven's Gate by Anthony Horrowitz the evil Mrs Deverill falls into a vat of acid in an old nuclear power plant as she is trying to kill the protagonist and open the word to the old ones! You have to love kids books! !